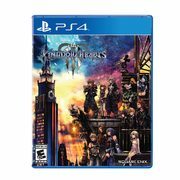 Amazon Canada Amazon + EB Games: Take $30.00 Off Kingdom Hearts III for PlayStation 4 or Xbox One! 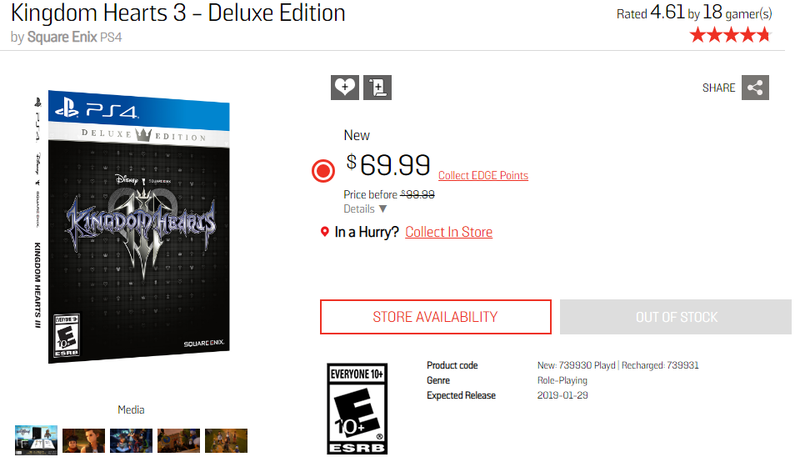 Take $30.00 Off Kingdom Hearts III! Join Sora, Donald, and Goofy on their next adventure, because you can take $30.00 off Kingdom Hearts III for a limited time! This discount is currently available at a few different retailers, giving you plenty of options to save! This offer is valid at Amazon.ca for a limited time and online and in-store at EB through April 18. Amazon.ca offers free shipping for all Prime members or on orders over $35.00 for those who aren't members. EB Games offers free shipping on orders over $35.00. Good sale. I wouldn't pick it up till the complete edition. The game was gutted like FFXV's first release. They stated that paid dlc is on the way to fill in gaps they made. RIP my wallet because I bought it day one for full price. ^ bought the deluxe also day 1 but with trade credits from eb games... still sealed btw! that's prob because most of the final fantasy stuff is gone and its almost fully disney now with attacks that resemble disney attraction rides at times. what happened to all the awsome stuff like meeting final fantasy characters and fighting a badass sephiroth and cloud and squall? I mean, it's been a decade since the second game. Nostalgia's a powerful thing. We've grown up, but SquareEnix's storytelling... Hasn't. I would also think taking 13 years to release played a part in losing it's magic. Can you wait until I start my 40$ I got from Future Shop before you drop the price? Damn! Kingdom Hearts games have never had good writing or cohesive story. Final Fantasy X, was the last game Square Enix had really good storytelling IMO. As a huge fan and having played through the whole collection recently - can confirm. - If you haven't played any of the side-stories, there will be gaps in your understanding of the story (but there are great summary vids on YT). This is a bad game. Combat consists of pressing the same button repeatedly to build up special and then repeat. Feels likes a Disney Infinity game. Yeah after KH 1 you better play KH 1.147585 before turning on KH2.248 to make sense of KH 3 BUT don't you dare to skip KH 475/4 Days and KH Alpha, Tilda, Epsilon and Birth by Chain of Memories Final Chapter Prologue. I regret buying the Deluxe edition at full price. Kind of find it comical how people loved KH2, but as soon as Nomura finally puts out KH3, suddenly they have a problem with the mechanics of the game. The thing is KH2, there is strategy to combat...element, double jump, block, dash, etc. Shooters require using both analog sticks. This game is just press x and Sora would go after the nearest enemy until they are all wiped out. Even turn based RPG is more complex than this game because it requires the use of directional buttons.